Simply contact our family support team on families@treeofhope.org.uk or via 01892 535525 to have a quick chat and run you through the application process. Raising funds may seem daunting, but with help from Tree of Hope many families have been able to raise sums up to and over £100,000. There are lots of ways to raise funds and we will give you access to our list of suggestions. Our family support team also have many ideas and resources for helping you to maximise the effectiveness of your campaign. One good way is through sponsored challenges which can be anything including a sporting activity, a high adrenaline stunt, a dryathalon (giving up alcohol for a period of time), a 5k jog or an ultramarathon, or even shaving your head! We can connect you with a host of sporting events and organisers to plan your challenge. Crafting a visible campaign with impact is crucial to getting those funds in, and we are on hand to give you as much help and guidance as possible. 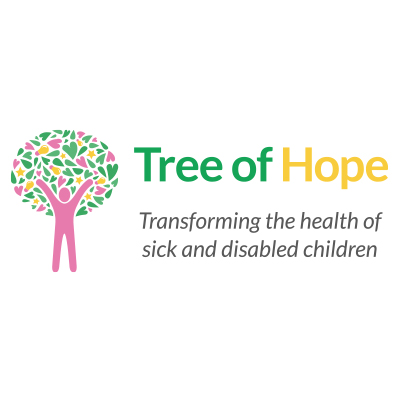 Tree of Hope website contains more suggestions which we regularly add to, and you can also get ideas from looking at what other Tree of Hope families have done in the past. If you are collecting a lot of small donations, we ask that you use JustGiving, a website which allows anyone to make a donation online. You can have several JustGiving pages if you run more than one challenge. We will send you information about how to set up a JustGiving page for a Tree of Hope account. What Happens to the funds I raise? All the money raised by Tree of Hope campaigns are donations to Tree of Hope and are used for its charitable purposes. Apart from a 7.5% contribution to cover the core running costs of the charity, the trustees designate the balance of all funds raised from a particular campaign to pay for treatment, therapy and equipment that will benefit the child. If for any reason the funds cannot be used for the child’s benefit, in particular if the child no longer meets the criteria of Tree of Hope’s charitable objects, or surplus funds are raised they will be transferred to the general funds of Tree of Hope. What are the fundraising costs? If a donor gives £100 and Gift Aids it to Tree of Hope, the taxman adds £25 to the donation. If the donation comes through JustGiving, they deduct 5% to cover their running costs, and the bank processing the payment charges an average of 27p. Tree of Hope then allocates 7.5% of each donation to cover its core costs of managing and operating the charity. This means £109.10 is available to support your child (and the wider objects of Tree of Hope). What Can Tree of Hope pay for? An initial assessment of your child’s condition from a medical specialist. Hospital treatment including surgery and fees from hospitals and medical specialists. Medical therapists including physiotherapists, speech and hearing therapists. Recreational therapists, including music, gym, rock-climbing, horse-riding and yoga therapists. Gym or pool membership for your child and a carer. Travel for treatment or therapy outside your home area. Equipment or toys specifically designed for a disabled person. Sensory items bought from a dedicated special needs supplier. Equipment commonly required for post-operation therapy, such as treadmills and tricycles. Items that are not specifically designed for a disabled person such as iPads or trampolines. Up to 50% of the cost of an adapted vehicle, or the cost of adapting an existing vehicle. What medical conditions do Tree of Hope support families with? When booking accommodation please ensure the relevant party invoices Tree of Hope with reference to your child’s full name. Your dates of stay should match with the dates of therapy or treatment you intend to go for. Can I ask for a payment to buy an adapted car to transport my child? Yes. We can pay a supplier up to 50% of a vehicle which is adapted to suit your child, or we can pay a supplier to adapt an existing vehicle for that purpose. Can I ask for a payment to cover travel and accommodation for my family? Yes, if it is not possible for you to leave other family members at home when you travel to a treatment centre, we can make a payment to travel or accommodation suppliers to cover their costs. We can also pay a daily living allowance, currently £55 per night away in the UK for the family or £75 per night away in the US for the family. Can I pay for travel and accommodation and claim them back from you? Not normally. Once you have booked accommodation or travel please ask the supplier to invoice Tree of Hope and we will pay them directly. For locations where we often pay for treatment we have recommended hotels that invoice us on favourable terms. Please discuss this with us if this is a concern. Can I ask for a payment for a family holiday? Because of the restrictions of our charity registration we cannot pay for an entire holiday, though we may be able to help with additional costs caused by your child’s condition. Please call us to discuss this. Will Tree of Hope make appointments with specialists, surgeons or therapists? No, you must do that yourselves. If we have approved payment for the treatment, you can tell the specialist that we will pay the invoice and s/he can check that with us if s/he wishes. If you turn down my request for a payment, can I appeal? Yes, but the commonest reason for our not being able to make a payment is that the funds would not be used in a way that is consistent with our charitable purposes. Appeals are considered by our senior staff and trustees. What happens to the interest or investment returns on campaign funds held by Tree of Hope? The interest and investment returns are used for running Tree of Hope and its services. Who runs Tree of Hope? Our office is staffed by a small team of dedicated staff who answer the phones and emails, manage the finances and arrange fundraising and publicity. The charity is overseen by a board of voluntary trustees who have charity and business experience.